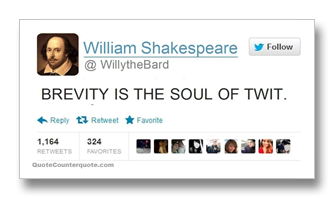 Ah, what would Shakespeare have made of Twitter? Would he have stuck with his belief that being brief is a lot harder than rambling on and on and on? Personally, I think he'd have been one hell of a tweeter--short, succinct, and pithy would have been his style. And what's not to love about that. The question, to me at least, concerns the art of brevity today as I write this post: is it better or is it merely an excuse for keeping it short. I have to admit, much as I love being brief for its own sake, today, I must stick to only a handful of lines because my time is running out. Doesn't that sound dramatic? Now you'll think I'm being chased by spies (what are spies in novel now--Russian? Syrian? Chinese? I don't know because I don't read spy novels as a general rule). Or by crazed monkeys in Voltaire's Candide, a truly weird story. 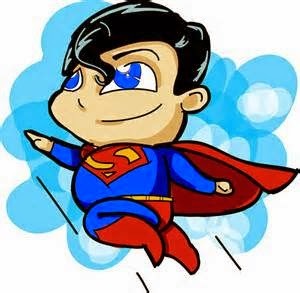 Lest you've already leapt from you chair in an attempt to come to my rescue, relax and sit back down, even you, Mr. Chubby Superman. I've only been out of town and am leaving again tomorrow morning and am running behind on everything. Last week I was with my sister in NYC, having fun and enjoying ourselves. And tomorrow I leave for a friend's wedding in Tennessee, so you see it's not life or death, merely a little bit of life's joy, as Goethe said, Enjoy when you can, and endure when you must. To extend this a bit more, click on this silly 40 second video of Polonius muttering the famous advice on staying brief. A modern, and very brief, bit of Shakespeare.